We are not seriously expecting the 2010 MacBook Air to be a hot performing laptop even though Apple marketing may use some performance hyperbole. Informed consumers know it is best viewed as a small, thin, feather-light, ultraportable laptop that doubles as contemporary art sculpture. But we are a performance testing lab and so we feel compelled to measure its performance in relation to other Apple laptops -- for a little perspective. There are two scenarios than intrigued us. First, there is a 13" MacBook Pro that is priced the same as the 11" MacBook Air with 128GB storage. So if you have $1199 to spend, one must wonder which performs better? The second scenario is to ask how the top MacBook Air model with 2.13GHz Core 2 Duo, 4GB RAM, and 256GB flash storage compares to the most popular Apple Laptop, the 15" MacBook Pro. So I threw the 15" MacBook Pro 2.66GHz Core i7 with 4GB of RAM and 500GB HDD in the mix. In this round of testing, we emphasize applications that make heavy use of the CPU. RED bar indicates the fastest result. Using Lloyd Chambers' "diglloydSpeed1" action file with 14 typical image editing functions or filters, we time how long it takes to complete them on a 300MB image. Fourteen MP3 tunes are converted to AAC. Though the MacBook Air can't compete with the 15" MacBook Pro in terms of CPU power, it does hold its own against the 13" MacBook Pro. If you are using apps like Photoshop on your MacBook Air, I recommend the 4GB CTO option for memory. As for storage, I recommend 128GB flash storage or higher. The 64GB option is much too limiting. We'll document this in a future article but when we ran a memory stress test, the 13" MacBook Air's memory had a bandwidth 25% faster than the 11" MacBook Air. However, the Flash Storage speeds were the same for both. We found a clever USB powered keyboard illuminator for the 2010 MacBook Air's keyboard and standard Apple keyboard -- both of which lack backlighting. 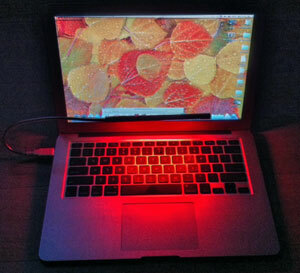 It's the Logiix USB Flex Lamp with red LEDs . It's more pricey than some LED flex lamps, but the red LEDs are less harsh than the white LEDs some flex lamps use. And the 10 LEDs are spread out on a tube so the light distributes better to the whole keyboard.